Star Wars: Attack Squadrons has been cancelled before the game has even left its beta. While it certainly wasn't X-Wing v. Tie Fighter, Star Wars: Attack Squadrons nonetheless looked like a new chance for fans of the beloved franchise to hop back into the cockpit of their favorite fictional fighter craft for a bit of of good old-fashioned dogfighting. Sadly, it would now seem that the galaxy's prospective pilots may need to look elsewhere for to get their fix of galactic chaos as it's now revealed that development of the game is being cancelled. According to a post on its Facebook page, the game is being halted so that its resources can be funneled into other presumably higher priority Star Wars projects. 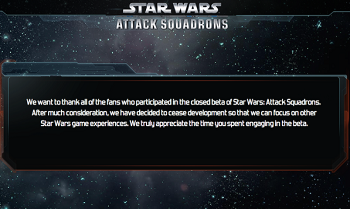 "We want to thank all of the fans who participated in the closed beta of Star Wars: Attack Squadrons," said the posting "After much consideration, we have decided to cease development so that we can focus on other Star Wars game experiences." Attack Squadrons had been under development by the studio Area 52 and was going to be published by Disney Mobile as a browser based title boasting 16-player battles with three PvP modes including Free-for-All, Team Dogfight and Base Defense.